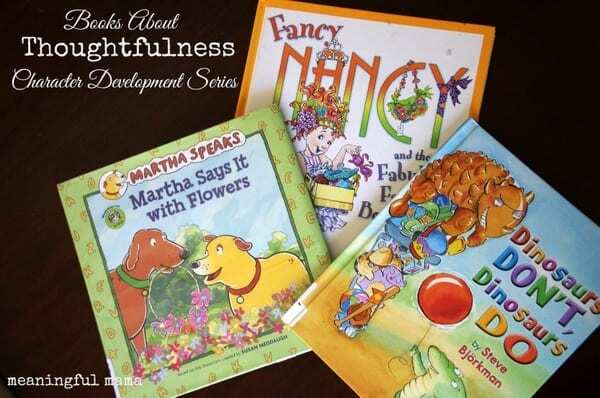 This weeks’ character development series focuses on the word of the week “thoughtfulness.” These books on thoughtfulness will help as you try and raise your kids with character in this world because kids learn from and can relate to books. They internalize stories. I want to review the concept of my character development series here in case you are tuning in for the first time. If you hover over the character development tab on my site, you will find the 52 words we work on (a different trait for each week of the year). I’ve been building this character development series for 2 years, and you will find 7-8 activities for each trait. This year I’m adding literature to the series. 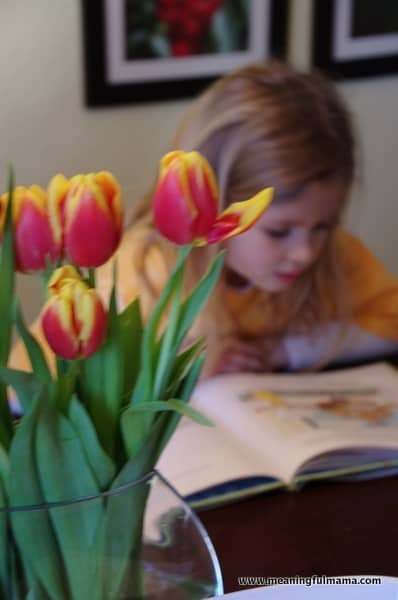 * Martha Says it with Flowers based on characters created by Susan Meddaugh – We found this book at the library. Martha is a dog who wants to get something special for a human in his life. Although his heart is pure, she is not being very thoughtful. Rather than picking out a gift that an elderly woman would enjoy, she keeps proposing ideas that SHE would enjoy. Therefore, her gifts are all wrong because they are meant for a dog. It takes a lot of heart and experimentation to understand what true thoughtfulness means. It’s a sweet story of a dog who truly wants to get the right gift for someone she loves. * Dinosaurs Don’t, Dinosaurs Do by Steve Bjorkman – When people are thoughtful, they consider their actions and how those actions will impact others. In “Dinosaurs Don’t, Dinosaurs Do,” it emphasizes the good things that dinosaurs do as they are being considerate to others. They contrast that with what they wouldn’t do. For example, the first image is of a dinosaur popping another dinosaur’s balloon. This is something a dinosaur wouldn’t do. In contrast, there is an image of a dinosaur giving a balloon to another dinosaur. That is what a thoughtful dinosaur would do. It’s a simple, cute book that my kids enjoyed. * Fancy Nancy and the Fabulous Fashion Boutique – We love Fancy Nancy right now. I think my kids can relate to her in many ways. As a mom, I love that it broadens my child’s vocabulary in a way they love. Nancy is an extravagant child, but I love her heart. She is a thoughtful young lady, and in this particular book she is working to raise money so she can buy her tomboy sister a pirate patch for her birthday. Her plan is thrown off when her sister suddenly takes interest in one of her fancy necklaces. You will enjoy how this plays out as she truly wants to love and serve her sister well.